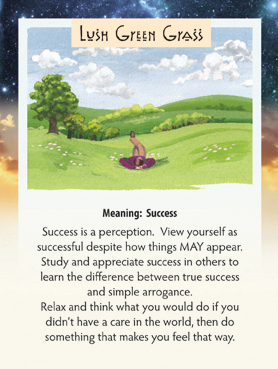 This week we have drawn the Lush Green Grass card, which means: Success. I know it isn’t always to FEEL that way if the evidence around you doesn’t support that, as I experienced last weekend. There is so much financial chaos and stress in the world right now, and of course some of that is personal. So yesterday, after all the trappings of Thanksgiving dinner were put away, and I was left to my own thoughts, I was really having trouble shaking a sense of anxiety. So I did things that I know make me feel good, like reading a great book in the sunshine, and then getting in the COLD pool and doing aquarobics. And then I got a phone call from a girlfriend inviting me to her monthly women’s group. I went to that gathering and felt so much support and got so much great advice about opening to success instead of focusing on what not had yet manifested that it shifted my energy into a GREAT place. Then wouldn’t you know it, I got a phone call first thing this morning from another friend about some new people that are really interested in my products! Actually, they just LOVED them! So sometimes your friends or family can help “lift up” your spirits to make the “success” energy flow around you again. And sometimes you do that FOR your friends. So do something wonderful for yourself or a friend today or all this week, and feel how uplifting someone else gives you a boost too!